Creeping buttercup is a common garden weed found in lawns, borders and bare soil areas with low-lying foliage that forms mats. It is the commonest of the buttercups and is an efficient colonist of areas disturbed by man and a troublesome weed of arable land. It thrives in wet, heavy clay soil conditions forming a dense network of shoots, runners and roots and its presence often indicates the need for improvements to soil structure and drainage. 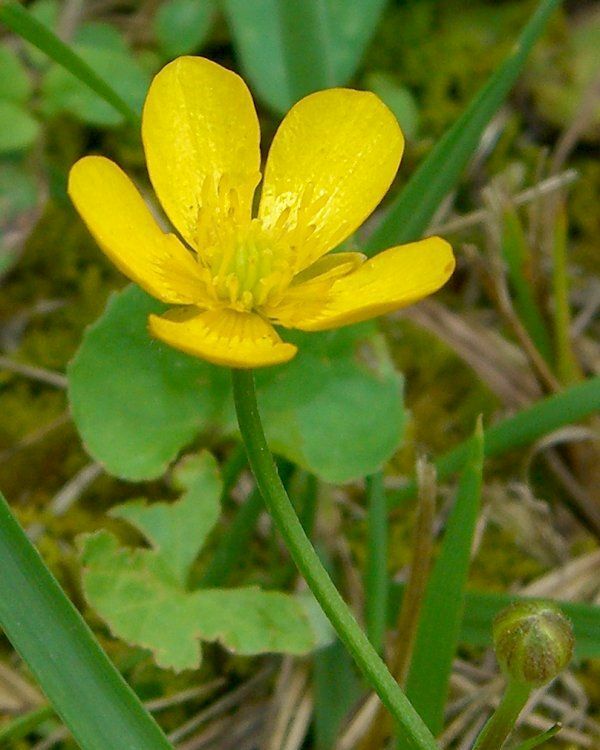 Creeping Buttercup can be easily identified with it’s glossy-yellow flowers from May to September however it has a courser, more low-lying foliage than meadow buttercup (R.acris) and does not bear bulbs like the way less yellow celandine (R.ficaria) does. In mown grass the yellow flowers will be absent but it’s three-lobed serrated leaves are easily identifiable. It often occurs in a band like formation along the bottom of ridges and furrows. It is common in gateways and paths as it is good at tolerating trampling and compaction. It can tolerate both waterlogging and a moderate drought. Creeping buttercup is a troublesome weed particularly in poorly drained soil that is difficult to control and can quickly smother grass in lawns and plants in beds and borders. It can also deplete the land of potassium and may cause a allelopathic effect on any neighbouring plants. It mainly spreads by seed but can also grow from small pieces of rooting stem. It spreads by sending out runners that creep across the surface of the lawn/soil and develops tough anchoring roots at several points along the way. Creeping buttercup is more palatable than other butter cups so may be grazed on by stock however it is likely to cause diarrhoea in both cattle and sheep.